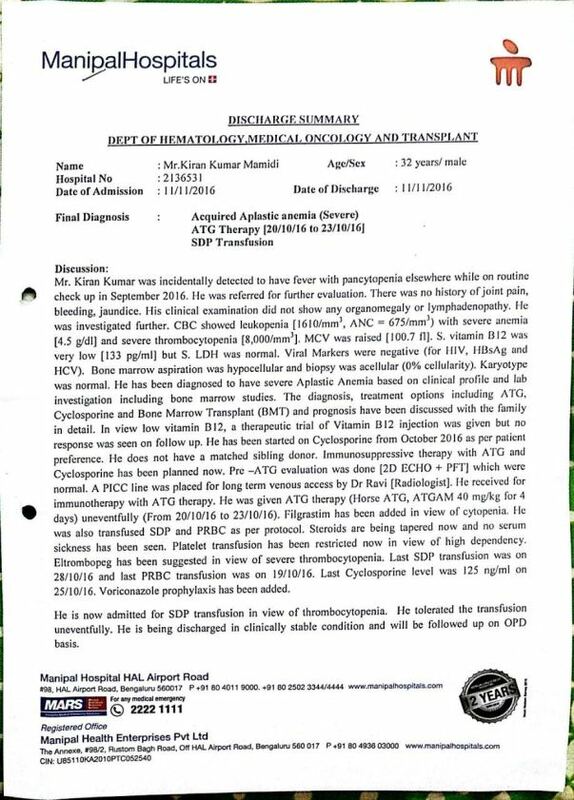 We came to know that Kiran M is diagnosed with “Acquired Aplastic Anemia (severe)”. Acquired aplastic anemia is a rare, life threatening serious blood disorder caused due to Auto Immune disorder. This is a condition due to failure of the bone marrow to produce blood cells and its components in the body like WBC,RBC, Hemoglobin, Platelets etc. The recommended treatments to cure this disease are ATG Therapy/ Bone Marrow Transplantation. He is currently undergoing the ATG Therapy treatment from Manipal Hospital, Bangalore. 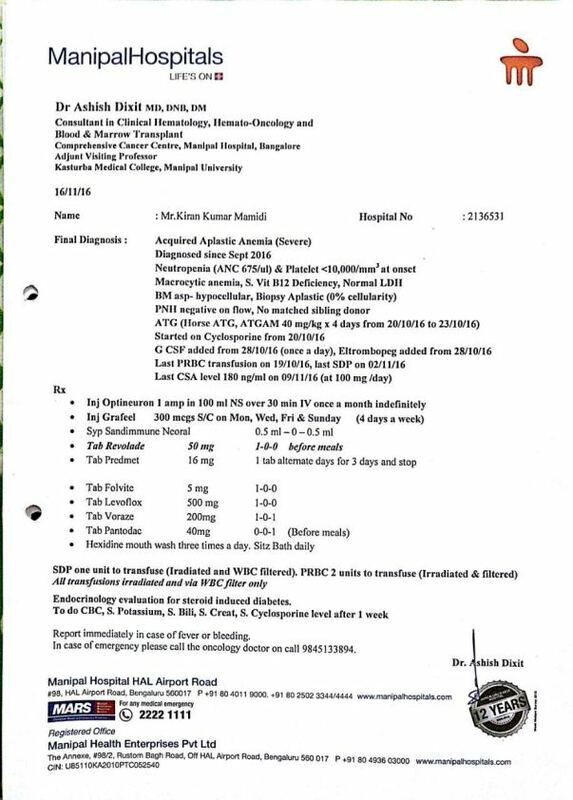 He is also getting transfusion for SDP & PRBC as per protocol. 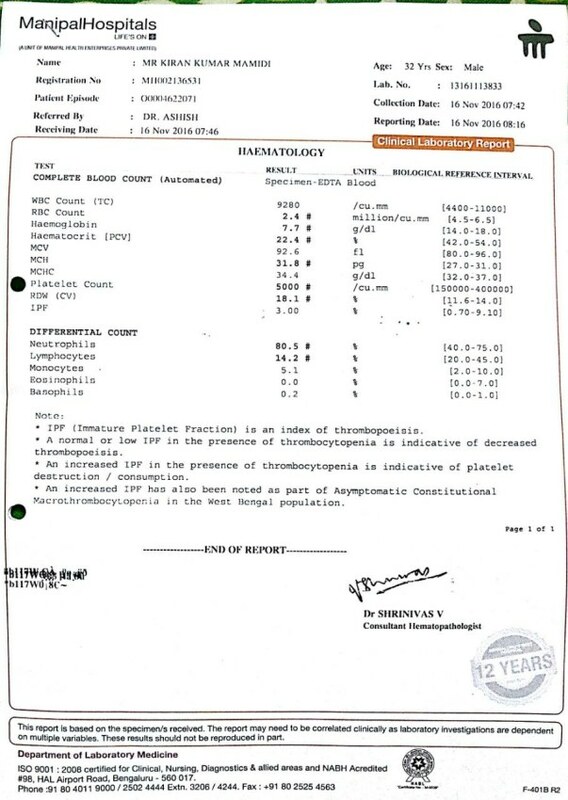 Every week he is undergoing CBC, Serum Potassium, Serum Creatine , Serum Cyclosporine tests per doctor advice. 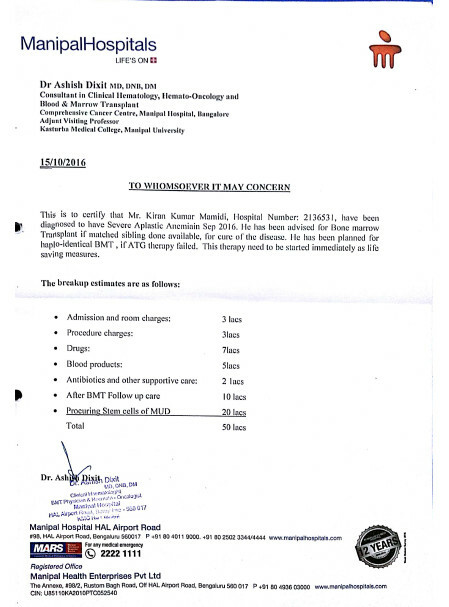 He need to undergo platelets transfusion on a regular basis whenever the platelet count drops drastically. 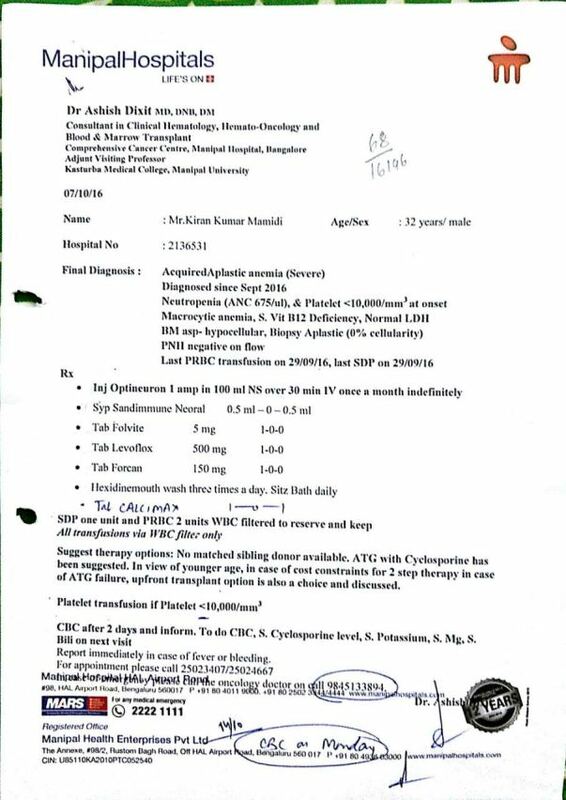 The overall cost estimated would be around 50 lakhs ( 15 Lakhs for ATG Therapy and 35-40 Lakhs for the Bone Marrow Transplantation). This fund raiser is created to provide financial assistance for his medical treatment that is currently ongoing and save his life. 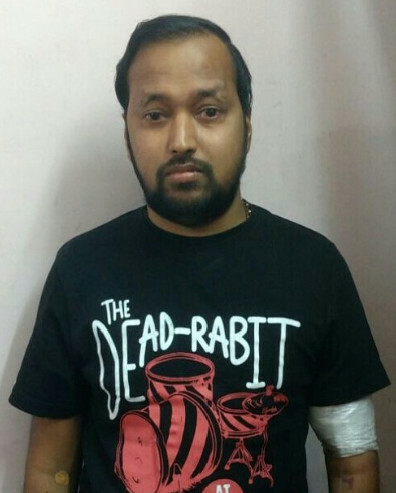 Encourage each one of us to support Kiran in whatever way we can. While doing money transfer you may mention your details. Also, you may help to reach out to others who can support him. 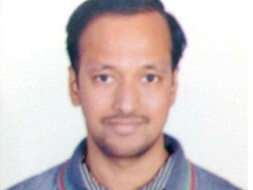 Let's pray to Almighty for a speedy recovery and extend financial support to Kiran. PS: Kiran's family have already spent 18 lakhs by exhausting their financial resources and through various loans so far for the ongoing ATG treatment. His entire family would like to thank each and every one of you for the kind support you have provided. Without your support this wouldn't have been possible. Please have him in your prayers and thoughts. My Recovery has started slowly from this February and the counts have gradually increased. Now the Haemoglobin stands at 10.9 and Platelets at 53000. They are almost stable at these levels for the last 2-3 months which are more than the minimum cut off levels for transfusion. My Doctor said it is a positive sign that I am sustaining without transfusion for the last 9 months. However, the complete recovery is a long journey which would take another 2 years. I am very very thankful to all of you for your kindness and all the support I got from you at my critical and most needed times. I am really short of words to show my gratitude towards you all. Your financial help and fund raising efforts from other friends was tremendous and significantly helped me in continuing my treatment. No words for a life saving effort. Please pass on my sincere gratitude and my recovery news to all other friends and colleagues who had extended their helping hand to me. I am always thankful to everyone. I would like to share a good news to you all. My recovery post my treatment of ATG Therapy is going well. My Haemoglobin and Platelets counts have started increasing slowly from the last two months. Even though these counts are very low compared to the expected minimal counts but still it is a good news that they are improving slowly. As per the latest blood report, my Haemoglobin is at 11.3 and Platelets are at 52000. So, just wanted to share this good news to all of you and I would be very very thankful for all the support I had received from you at the time I need the most. I will remember all the support I got from you forever. I am running out of the words to show my gratitude towards you.